Geneva Lake camps provided education, activities, spirituality, and community in a healthy environment away from the city. The first sites were located on the western shores of Geneva Lake, with Camp Collie established in 1874; seventeen more followed. Although most camps were spiritually based, they differed in what they offered and who they served. People attending the camps came from all income levels and many cultures. Adult- and family-oriented camps provided a setting for vacations or conferences, and children's camps prided themselves on fostering responsibility and solid values. 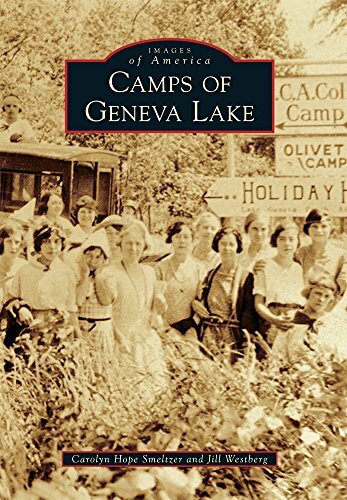 Images of America: Camps of Geneva Lake highlights 18 camps in the days of woolen bathing costumes, steam yachts, and platform tents. "The information is fascinating, but the highlight of the book is provided by the dozens of photos of campers and camp life that stretch from 1874 through the present day." "The Beacon"